The Giant Celestron 15x70 Skymaster Binoculars offer state-of-the-art technology, phenomenal performance and all at an incredible price. Designed for astronomical viewing, SkyMaster binoculars bring star fields, Jupiter and its moons, Saturn's rings, and globular star clusters into clear view, afording you a spectacular and unique peek at the universe. What is also fantastic about this Celestron binocular is it's versitality as they can also be used for other uses including bird watching and wildlife viewing or any other terrestrial use that requires long distance observation. 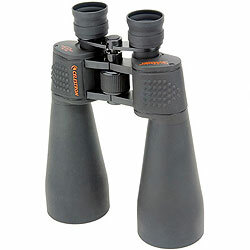 The 15x70 Skymaster Binoculars also feature high quality BAK-4 prisms and have multi-coatings for enhanced contrast and to transfer the maximum amount of light to your eyes and In dark-sky environments, even objects like galaxies and nebulae are within reach of a Celestron SkyMaster Binocular. The Celestron SkyMaster 15x70 binocular is water-resistant and has an adaptor alowing it to be fitted to a standard tripod fitting. Other features include a protective rubber covering for ultra-firm grip, a large center focus dial for easy focusing, long eye relief ideal for eyeglass wearers and a carrying case included for travel and safe storage. The Celestron No Fault Warranty gives you peace of mind with one of the best protection and product support on the market. Overall this SkyMaster 15x70 binocular offers serious large aperture light gathering binocular at an affordable price and reasonably lightweight configuration. 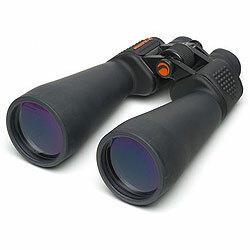 Versitile astronomy binoculars that can also be used for many and terrestrial applications.